During the summer months you can eliminate algae easily, effectively, naturally and attractively with the simple addition of appropriate pond plants to your water garden. Three factors contribute to excess algae growth: sunlight, nutrients and low oxygen. While it may be impossible to eliminate every speck of algae – it is still part of your aquatic ecosystem, after all – when you work to control those factors, you also control and minimize algae without adversely affecting your water garden. Algae needs abundant sunlight to reproduce, and sunlight also raises the water temperature which helps algae grow even more quickly. 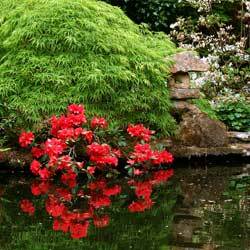 In shady, cooler ponds and water gardens, however, much less algae is able to grow. You can easily reduce the amount of sunlight reaching the water surface in your garden by 40-60 percent by adding floaters that will cover the surface and provide shade. Top water garden floaters include water hyacinths and water lettuce, both of which successfully reduce excessive algae growth. For the best results, cover 50 percent or more of the water’s surface area with floating plants. Because algae can grow so rapidly, it requires abundant nutrients to reproduce. If you remove those nutrients, there will be less nourishment available to sustain algae growth. Submerged plants, such as water lilies and lotus, compete with algae for limited available nutrients, essentially starving the algae to death, while at the same time adding their own beauty to your backyard pond or water garden. If fish are part of your container garden or pond, be sure you are not overfeeding them, since excess, uneaten food quickly decays into vital nutrients algae can use as well. Similarly, prune and clean out any decaying plant foliage so it does not become the nutrients algae needs. Algae thrives in stagnant water, and abundant oxygen is toxic to these simple growths. Oxygenating plants like milfoil and hornwort should be included in your plant choices to increase the oxygen in your water garden and make it less suitable for algae. More oxygen will also be healthier for any fish, frogs or toads that might call your water garden home, and many other water garden plants will also thrive with better oxygen in the water. Stop in and see our extensive collection of water garden plants and supplies. 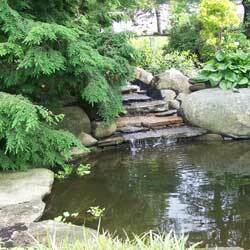 Our well-informed staff will assist you in making the best choices for your water garden to help reduce algae growth and keep your water garden or pond clear and sparkling.